Employee retention refers to the ability of an organization to retain its employees. Good organizations not only hire the best talents but also know how to retain them for a longer period of time. Employees are the lifeline of any organization. When these skilled employees walk out of the door, it becomes difficult to find good replacements. High turnover not only affects an organization’s bottom line but also is a costly process. And it is often more difficult to train new employees. Studies say that for a new employee to fully adapt to a new organization, it takes more than 8 months of onboarding and sometimes even more. Even with good compensation and benefits, employees quit. The reason for this varies with many factors. 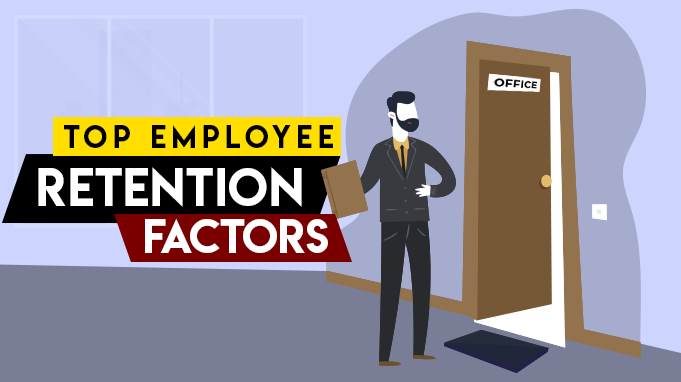 Here in this blog, I am going to talk about the top 8 employee retention factors. Before I start, let’s look into the following employee retention statistics. In Human Resources, employee morale is defined as job satisfaction, outlook, and feelings of well being an employee experiences in a workplace. According to Dalton E. McFarland, morale is basically a group phenomenon. It is a concept that describes the level of the favorable or unfavorable attitude of employees on their work, the company, their tasks, work environment, fellow workers, superiors and so on. Employees are happy and more productive when employee morale is high. Likewise, low employee morale results in less productivity and low spirits. Low employee morale is one of the major factors why an employee leaves an organization. Employees don’t just simply quit their jobs. They do it when they are not happy with the organization’s work culture they work for. Often employees are not content with their career path. Lack of proper training and development programs hinder their career growth. Their skills become limited with time and they lose interest in what they do. Every employee has his/her own talents. It is an organization’s responsibility to show them the path where they can use these skills and give their career a direction. Every employee wants to excel in what they do and grows in the process. It is important for them to know where their career is heading. A sense of security is a must for every employee. Nobody wants to ride a boat without a rudder. Organizations often miss out on understanding this human perspective of their employees. Same monotonous work profile or assigned tasks makes the employees vulnerable at times. Eventually, they leave their organizations for better career growth and prospects. Employee manager relationship is crucial. Employees crave good relationships at work. It is important for the manager or any business leader to form an interpersonal connection with their employees. For most of the employees, often good salary and benefits may not keep them engaged and happy if they can’t tolerate their managers. When managers lack good management skills, they fail to form a good work relationship with employees. This eventually leads to high employee turnover and the bottom line. Effective leadership involves reinforcing and motivating employees to bring out the best in them. Society for Human Resource Management reported that the most important workplace challenge is employee turnover and retention. Also in the same survey report, 71% of respondents believed employee recognition programs increased retention. Employees seek appreciation and recognition for the effort they put in their work. Financial and non-financial rewards do the trick in this aspect. Organizations who do not know how to recognize their employees fail in the long run. Therefore, rewarding them for good work or publicly appreciating for it makes them feel motivated and bring more productivity. Work-life balance is becoming gradually more important for employees and tends to affect employees’ decision to stay in an organization. Nowadays employees long for flexible work schedules which allow them to take care of both their personal and professional life. The balance between personal and professional is critical for them. Employee retention strategies are important. The soon it gets, the better it is. New hires tend to leave an organization when their expectations are not met. Onboarding and training practices are must to help the new hires find their foot and be comfortable. This can start by providing them with social support, formal and informal activities, and training and shared their learning experience. Tom Rath and Jim Harter, Ph.D., the authors of the bestseller ‘Wellbeing: The Five Essential Elements’ says people tend to enter an organization for career wellbeing and financial wellbeing. Along these social, physical and community wellbeing is equally important for any individual. Organizations should not shy away from this fact and provide their employees with good wellbeing programs such as free gym membership, onsite health clinics, and community building. It is important for the employees to know that their employers care for them and also are responsible for how they feel. When their wellbeing is at stake they are more likely to leave the organization. In a 2016 study on the Determining Factors of Employee Retention in the Open Journal of Social Sciences, researchers concluded that the relation between pay and retention is always relevant. Researchers are not unanimous on its impact on retention though. For some, paycheque is a factor for an employee to stay in the organization. For some, it does not impact much on retention. The study also concludes that improved compensation can boost retention for a short period. For an organization to be more effective in retaining their employees for a longer period, improved compensation should be coupled with the quality of work-life. You cannot retain each one of your employees forever, sooner or later some of them are going to leave your organization. This is the bitter truth and you should never shy away from it. All you can do is reinvent your employee retention strategies from time to time and be relevant in the business and adapt to the change. The moment you are aware of these factors I talked about, you know the strategies your organization needs to come up with. If you are yet to decide then take a step forward and retain your valuable employees with these 20 Best Employee Retention Strategies.